Having looked at thousands of hair color photographs and pictures of women with blonde hair, I can honestly say that I have a pretty good understanding of what types of blonde hair colors look flattering on older women verses those blonde hair colors that don’t flatter a mature woman. I am going to point out these hair color tips to you right now since you can very well knock ten years off your age simply by getting the right shade of blonde. I’ve put together a sampling of photographs of dirty blonde hair with natural highlights worn to perfection. Too Blonde Hair Color equals Grey Hair Color. Overly light hair can wash out your face and make your wrinkles show more! Too blond hair color verges on being grey hair at least in my opinion. I believe that a woman in her forties, fifties and even sixties can easily color her gray hair downwards to a nicer shade of darker golden blond and look years younger as a result. I don’t believe in wearing your gray as a badge and being proud of gray hair. In fact I think that concept is ridiculous. If gray hair looked flattering on a woman, then I would like it. But since it really fades her face into nothingness and provides no kind of picture frame for it, I hate it. I think Jamie Lee Curtis could die her hair and look prettier. I like her, just not the salt and pepper gray she sometimes sports. The only exception to my hatred of gray hair is that I think it looks fine on women entering the true sunset years. I mean, if you are pushing seventy or so, gray hair starts to look natural and appropriate for your age bracket. It starts to fit. You can only turn back the clock so far. I think that the woman who played Rachel McAdams mother in the The Notebook (Gena Rowlands) with her whipped smooth blow dried white hair actually looked nice. So I guess I could say there is a cut off. If you’re youthful enough to dye and have it look natural, I vote cover the gray. If you are getting on in years and up into seventies, the white hair starts to fit a whole lot better and at that point it can potentially make sense and look classy to have white or silver hair color. I agree with the nice n easy hair color slogan cover the gray unless you are much, much older. If you are a baby boomer they you probably wanted to get rid of your dirty blonde hair and turn it light blond and gorgeous! Now that you are over forty, you should be trying to get it back to it’s original dirty blond color you were born with LOL! 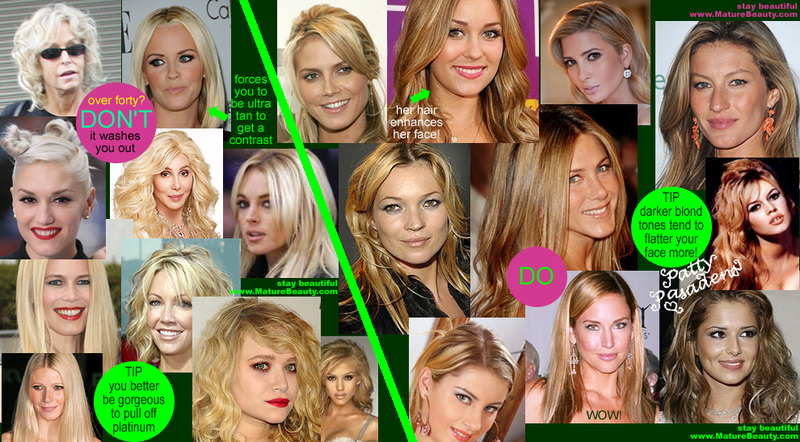 The reason I like dirty blonde better than light blond is that the darker blond creates a color frame around the face. If you take an older face and place white hair around it trust me you will see that the white hair fades into nothingness and what stands out are the face and of course the facial flaws. If on the other hand, you provide a slightly darker frame around the face, you actually will see that facial features such as your eyes and eyebrows, get drawn out more. Facial flaws fade out more. That is exactly what you want. Dirty blonde is good and if you add a few choice golden highlights to it you’ll get the dazzle you want without having to go all the way up to unflattering and often damaging pure blonde. Decades ago, when you decided to dye your hair, you may have read the hair color advice for women. Start with your original natural color and try to take it up several shades but never more than two or three shades lighter than your natural color. Have you ever heard that advice? Well now that you are over forty you should be discarding that advice and doing pretty much the exact opposite. You should be trying to get back to an original (or original looking) natural hair color. Why? Because original natural color looks younger and it is going to be the most complimentary to your skin tone. Granted it doesn’t have to be your real, real original color, but it has to look real, like an original natural hair color. The more natural and vibrant hair looks, the younger you’ll look. Twenty years ago you were trying to go from dirty blond to blondest blond, now you should be going from blondest blonde (or gray, which is similar to platinum) right back down to dirty. You are going in reverse. The more your hair looks natural blonde, the younger you are going to look. Just so that it doesn’t get too drub, you can add a few choice highlights maybe around the face to look like you’re been playing in the sun and have natural sun high-lights. Boom, I am describing (and loving) Jennifer Aniston’s and Ivanka Trump’s dirty blonde hair with golden highlights. Trust me I look at photographs all day long and I look at not only the hair color, but what the hair color is doing to an older woman’s face. Dirty blonde with natural golden highlights is a wonderful look for women at any age. Have you ever heard of low lights? Let me explain what they are. Low lights means you are adding streaks of color back into your hair that are darker than your current color. It’s like getting a hair weave but instead of getting blonde you are getting a darker color such as light chestnut brown. Why are the hair salon stylists doing this? Because you’ve died your hair too light, or gotten too many highlight weaves on top of weaves on top of weaves. Now your hair is ultra blonde all over and there is no color contrast left. You’re light and you’re washed out. You may not know it but the colorist sees it plain as day. She (or he) realizes that the color is almost like gray, it’s washing you out and doing nothing for you. There’s no color variation left and no color depth. So she decides you need the low lights put in to undo the problem. Low lights can be a short term solution but the only problem is that the dye rarely sticks in your hair for very long. Pretty soon it will fade and you’ll be back to the brassy blonde. Low lights can work, but you may be better off re-dying your hair back to a more natural looking darker blond or light brown. Then add a few choice golden blonde highlights around the face and quit getting constant weaves that only serve to change your overall hair color to fake looking blond. Low lights are an effective short term solution that can work and may not last. If they are done wrong, you can look like you have striped hair which is not good. You should want to avoid needing the low lights in the first place. The very fact that someone is suggesting low lights is a red flag that you’ve gone too one toned blonde as a result of multiple weaves or aggresive lightening. Do it yourself Dirty Blonde hair with Gold Highlights – get the Ivanka Trump million dollar look for alot less money! Getting blonde right is really a tricky endeavor if you are trying to do this at home. I’ve found that colors like platinum blonde, ash blonde, champagne blonde and blondest blond are way too light for older women. Furthermore, some of the at home blonde hair colors come out looking really drab with almost a gray or green undertone to them. Blonde hair color at home is tricky. The thing to do is to try a test patch on a reasonably big clump of hair preferably on the underneath side where it doesn’t show. This is going to give you the best idea of what the color will look like. The really light brown colors or those with a golden blonde tone tend to work best but don’t risk anything without a test streak. I like revlon color silk which is a great hair color for the price you pay. Home hair dye seems inexpensive but once you are addicted to a home hair color you’re buying new boxes of it every couple of weeks and price does factor in after a while. It adds up. You can also try garnier nutrisse hair color which initially looks too bright and metallic because it is so color rich in my opinion, herbal hair colors, loreal hair color, feria, goldwell hair color, clairol ultress hair color and others. I’ve tried dozens of drug store and beauty supply store hair colors and it’s amazing how different the colors come out! The same exact looking hair color in two different hair brands can look amazingly different once applied to your hair! Consider home hair dye a science project and methodically test on a patch of hair before committing! Test streak! If you are planning to do at home highlights you also have to be careful. I find that using hair dye as a high lighter is minimally effective. The at home hair dyes tend to fade very quickly so if you use a lighter blond as a highlight it probably will fade away very quickly. I actually like those highlight/frosting kits which are pretty much just peroxide bleach and developer. I do not recommend frosting your whole hair in its entirety with lots of highlights because you could end up looking tacky and splotch striped. If you are doing highlights at home on your hair by yourself, only do a few streaks! My beauty tip is to only do a handful of highlights, no more than a dozen. It’s just meant to add a natural sun kissed effect. If you want a complete weave get it done in the beauty salon or skip the full weave altogether. A few casual golden highlights towards the front of your hair (ala Jennifer Aniston) can be easily done at home with one of those frosting kits. Pick out a few pieces (4-10) of hair and apply the frosting to the hair, you can lay foil under the pieces to keep the bleach away from the rest of your hair. Try this on a test streak as well and carefully time it. If you want anything more than a few subtle highlights around the face, get thee to a hair salon and have it weaved professionally (though they can mess it up too). Die your hair with the all over color about once a month. Use the frosting for 6-12 sun highlights whenever your hair needs a sunny pick me up. I hope you enjoyed these hair color tips and can find the right shade of blonde that will anti-age you. Don’t just pick a hair color shade you like, pick a hair color shade that your face likes and defy your age! Remember not to go too light because if you do, you’re no better off than you are being gray. A dirty blonde hair shade is the most flattering for a mature face because it adds a contrasting color frame around the face, and having some deeper color tone effectively distracts from the wrinkles and facial flaws of an aging face. A few natural golden toned highlights adds that sun-kissed glow, color contrast and pizzazz to the dirty blonde look. It’s a universally gorgeous hair color combination for ladies. Look at the hair colors in the photograph to see the natural dirty blonde hair with sun kissed golden highlights look that I adore. Hair color for the mature women! All blond or gray hair does not flatter a woman's face as much as dirty blonde hair color with natural golden sunkissed highlights. Celebrity Hair DO!